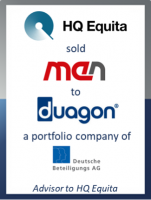 Hans Moock, Managing Director of HQ Equita, highlighted the business logic of the merger: "Due to duagon’s highly complementary technology and the two well-matched management teams, we believe the merger will create a leading technology provider for secure computing and communications solutions in the rail sector. Such a combined group is ideally positioned to benefit from the positive developments expected in the future in the field of railway electronics and other mission-critical markets, including medical technology, avionics, power & energy and special industrial applications." Bernd Härtlein, current CEO of MEN and future CEO of the Computing business unit, added: "The merger of duagon and MEN is a major first step in creating a market leader in rail and market computing, wherever there is a need for highly reliable and secure solutions. In particular, I see great potential in duagon’s hardware-related software competence and its strong position with Asian customers." Sascha Pfeiffer and Axel Bauer, both Managing Directors at GCA Altium, commented: "We are very proud to announce this transaction for our client HQ Equita which forms a leading global technology vendor for secure computing and communications solutions. This strategic combination marks the next step in the growth of both companies and ideally positions them to benefit from the positive developments expected in the future in the field of railway electronics and other mission-critical markets."